Take this simple palmistry questionairre and find out about what your palms say about you! 1. Choose the hand type that best describes you. 2. Look at your fingernails. They indicate your health. Choose the most appropriate answer that describes your nail shape. Short Nails. More Broad than Long. Broad, Long Nails, Rounded Tip. 3. Look at your nail color (without polish) and select the most appropriate answer. 4. Look at where your palm ends, and your fingers begin. Select the most suitable answer from the list below. (Compare the line against middle finger). My fingers join the palm as an even, straight line. My index finger is set lower than my middle finger. My ring finger is set lower than my middle finger. My baby, or pinky finger is set extremely low compared to my middle finger. 5. Stretch your hands directly out in front of your body at an arms length. Relax your hands, and now analyse your �natural� hand span. Select the best description from below. My fingers are held stiffly together. My fingers are unevenly spaced apart from each other. My fingers are all very well separated from each other. I have wide gaps between all of my fingers. 6. Where do you notice the largest space between your fingers? Select the most appropriate answer. Widest space is between my thumb and my first fingers. Widest space is between my index and middle fingers. Widest space is between my middle and ring fingers. Widest space is between my ring and pinky fingers. My 4th finger, (pinky, baby finger) is very separated from all the rest. This question does not apply to my hand type. 7. Examine your finger length. 8. Describe your finger shapes. 9. Describe your finger joints. 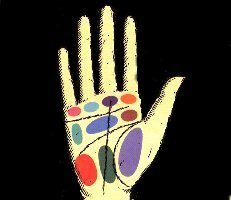 *The next section of this palmistry questionairre focuses on the Mounts of the Palm. The following is a color coded picture to follow if you are not familiar with the Mounts. 10. Look at the length of your JUPITER finger (a.k.a., the first finger, index, or forefinger.) Choose your description. The top is level with the bottom of the nail on the second finger. The Top is below the bottom of the nail on the second finger. It is the same length as, or longer than, the second finger. It is a normal length, but it is shorter than the third finger. The top phalange bends toward the second finger. It is the same length as the third finger. It is longer than the third finger. 11. What are the Characteristics of the JUPITER finger? (forefinger, first, or index finger). Straight, and in proportion to the other fingers. Slightly longer than the first (Jupiter) and third (Apollo) fingers. This is the longest finger. Same length as the first (Jupiter), and third (Apollo) fingers. 13. What is the length of your APOLLO finger? (a.k.a. fourth finger, ring finger). Second and third fingers bend together. Nail phalange bends toward second finger. Bends or droops toward palm when hand is relaxed. 15. Describe your MERCURY finger. (a.k.a. pinky, baby finger). It reaches above the top crease on the third finger. It reaches the nail on the third finger. It has a long top phalange. The top phalange is longer than all the other fingers� top phalanges. It has a very short third phalange. It bends toward the third finger. It bends toward the palm when the hand is relaxed. 16. What are the characteristics of the Thumb? 17. Look at your MOUNT OF VENUS. (Located on your palm directly below the thumb.) Select the best option. Connected to the Mount of Saturn. Leans toward the Mount of Mercury. Connects with the Mount of Mercury. Marked by many short, straight lines. *The next section focuses on the Main Lines of the Palm. The following is a diagram of the main lines found in Palm Reading. Slopes toward the Mount of the Moon. Long, and reaches the top part of the Mount of the Moon. 26. Where does your HEADLINE begin? It starts by touching the lifeline. It starts with a small separation from the lifeline. It starts with a wide separation from the lifeline. It starts linked to the lifeline for a distance. It starts inside the lifeline on the Mount of Mars. 27. How does your HEADLINE end? It ends with a large fork that touches both the mount of the Moon, and the heartline. It ends with a small fork pointing to the mount of the Moon. It ends with a large fork. It ends with a 3-pronged fork. I have a branch line that goes to the Mount of Jupiter. I have a branch line that goes to the Mount of Saturn. I have a branch line that goes to the Mount of Apollo. I don't have an extending branchline. 29. What is the quality of your HEADLINE? It has a chain- like appearance. There is a break in the line. There are many discontinuities in the line. It is long and straight. It is long. It reaches the lower part of the Mount of the Moon. It runs toward the center of my wrist. It curves up toward the heartline. It runs close to the heartline. It is weak, and runs some distance from the lifeline. It is long, and slopes at the end in a fork shape. It ends at the Mount of Mercury. It ends between the third and fourth fingers. A branchline goes to the Mount of Mercury. It is long, curved, and lies some distance away from the base of the fingers. It is longer and stronger than the headline. It is short and faint. It is very long, deep, and close to the fingers. 32. What is the appearance of your HEARTLINE? It has a chain-like appearance. It has a blurred appearance. It is broken in many places. It is broken under the third (middle) finger. It has many broken sections that overlap. 33. How does the HEARTLINE look overall? It starts between the fingers of Saturn and Jupiter. It has a chain-like appearance and starts on the Mount of Saturn. It starts at the same point as the headline, and the lifeline. It runs together with the headline, as one line. The branchline runs to the fateline. It has many small branches. The branchline runs to the headline. 34. Where does your HEARTLINE begin? It starts in the middle of the Mount of Jupiter. It starts with a fork on the Mount of Jupiter. It starts with a large fork, with one prong on the Mount of Jupiter. It starts on the Mount of Saturn. It starts on the Mount of Jupiter. It starts from the headline. It starts well below the headline. 36. Describe the branches found on your LIFELINE? There are 2 small branches from the beginning of the lifeline, going up to the headline. The branchline goes to the headline from halfway down my lifeline. The branchline goes to the Mount of Apollo. There are many small branches running upward from my lifeline. The lifeline ends in a fork with one branch ending in the Mount of the Moon. A Branchline goes to the Mount of Jupiter. A Branchline goes to the Mount of Saturn. A Branchline goes to the Mount of the Moon. 37. What are the characteristics of the LIFELINE? It is long and clear. It is short and checkered. The line has many discontinuities. There is a break in the lifeline in one hand only. There is a break in the lifeline in both hands. No line exists on my hand. My line is straight and unbroken. It starts from the bottom of the lifeline. It starts from the top bracelet. It starts from the Mount of Venus and ends on the Mount of Saturn. There are broken sections that overlap each other. There is a short bar across the line. It reaches the Mount of Saturn. It curves toward the Mount of Jupiter. It starts from the headline and goes to the heartline. It starts from the Mount of the Moon. It ends on the headline. It ends on the heartline. It ends on the Mount of Apollo. A branchline goes to the line of Apollo. It is clear and straight. It starts close to the wrist between the Mount of Venus and the Mount of the moon. It ends in the Mount of Apollo. It starts with the headline. It starts with the heartline. It starts from the lifeline or fateline, and ends in the Mount of Apollo. It ends with many small lines. It starts from the Mount of Venus. It ends with a fork, with a prong on the Mount of Mercury, Saturn, and Apollo. I don't have this line. It is blurred or broken. It crosses the lines of fate, and the line of the Sun. It ends on the Mount of Mercury. It runs off the side of my hand rather than creating a semicircle. It is straight, long, and reaches the Mount of Mercury. It is curved, and begins at the Mount of Venus. A Branchline reaches to the line of Apollo. 45. How many of your CHILD LINES are weak? It has a strong curve upward toward the base of the pinky finger. It curves upward to the line of the Sun. It is crossed by a single line that runs from the base of Mercury. It is crossed by the girdle of Venus. 48. What are the characteristics of your FINGERPRINTS? 49. Do you have deep, straight, vertical lines on your fingers and hands? 50. Do you have a Mole anywhere on your hand? 51. Do you have chains on your palm? 52. Do you have a forked line on your palm? 53. Do you have a cross on your palm? 54. Do you have a star on your palm? 55. Do you have a square on your palm? 56. Do you have a triangle on your palm? 57. Do you have a grille marking on your palm? 58. Do you have a circle marking on your palm? 59. Do you have parallel, clearly market bracelets on your wrist? 60. Do you have a chain-like top bracelet on your wrist? Copyright � 1998-2018 FortunesNow Ltd. All rights reserved.